With today’s swiftly moving technology, it’s increasingly difficult to keep on top of all the new social networks, review sites, and search engines. When trying to see what has been said about your business on these websites, it’s downright difficult and time consuming to check each site manually. If you consider that a new wall post can be made at any time of the day or a customer is more likely to leave a review after a negative experience, it’s necessary to continually check those same websites, where your business’ reputation exists, over and over again. If you’re anything like me, you are probably thinking “there has to be a more efficient way”! Google Alerts to the rescue! 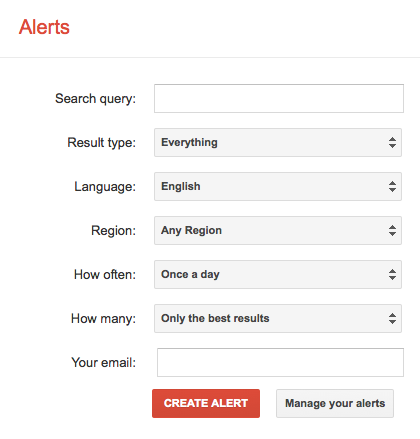 Google Alerts allows anyone with a Google account to monitor the latest relevant Google results of search queries (like the ones you type into google.com) by creating an Alert and having Google do the work for you! Alerts can be used to monitor a developing news story, keeping current on a specific competitor or industry, getting the latest on an event, and so much more. Today, I’m going to show you an example on how to configure Alerts so it can be used to find what’s being said about your business, online. Head on over to the Google Alerts page to get started. Anything after the search query can be setup to your preferences. I recommend using an email address you check frequently so that you can stay current with all of your Alerts. I also set “Once a day” and “Only the best results” so that Alerts provide the highest quality of information without overburdening my Inbox, but this can be adjusted for each Alert. If you want a more comprehensive tool designed specifically for monitoring your online reputation, take a look at ReputationRepo™ - “Easy to use toolkit to monitor your local listings, compare your online presence to your competitors, and see what your customers are saying about you on review and social media sites.” It’s easier to setup and can monitor reputation for any and all local businesses. Right now, there’s even a full featured free trial. The examples above barely scratch the surface on what Google Alerts are capable of. I encourage you to take a step back and think about creative ways you could take advantage of this powerful tool!